This, the only translation of Mein Kampf which was officially endorsed by the Nazi party during Hitler's lifetime, represents an opportunity to try and understand the twisted madman's evil to come exactly as it was presented to readers at that time. CBI: Chinese General Ma Zhanshan declares the Heilungkiang Provincial Government in Japanese-occupied Manchuria in northeastern China. Later this organization becomes the Northeast Anti-Japanese National Salvation Army. Germany: The Gau organization, the large permanent offices of the Reich, is established to centralize the political structure of Germany. Hitler appoints himself as the Prussian representative. Germany: Hitler announces his new "Law for the Restoration of the Professional Civil Service" which allows the Nazi Party the legal right to dismiss and replace any State employee. Among the first workers fired are Jews. CBI - China: Day 97 of 142 of the 1st Battle of Hebei. Spain: Day 265 of 985 of the Spanish Civil War. Spain: Day 630 of 985 of the Spanish Civil War. CBI - China: Day 275 of 2,987 of the 2nd Sino-Japanese War. Day 60 of 124 of the Battle of Henan. Day 15 of 15 of the Battle of Taierzhuang. The Japanese troops have withdrawn, leaving the city to Chinese forces. Day 15 of 39 of the Battle of Xuzhou. Spain: Spain joins Germany, Italy and Japan in officially signing the Anti-Comintern Pact, pledging to mutually resist communism and the Communist International (Comintern, initiated in Moscow during March 1919). Italy: Benito Mussolini, jealous of Hitler's successes, sends his troops to invade and annex Albania, which had been under Italian influential control since the Albanian Civil War of 1925. CBI - China: Day 640 of 2,987 of the 2nd Sino-Japanese War. Day 22 of 54 of the Battle of Nanchang. Atlantic: The RAF spots units of the Kriegsmarine steaming north toward Narvik and Trondheim, Norway, loaded with troops and equipment. The UK sends bombers and ships to attack them, but are too late. CBI - China: Day 1,006 of 2,987 of the 2nd Sino-Japanese War. Day 145 of 381 of the Battle of South Guangxi. USA: US Navy transfers 3 battleships, 1 carrier, 4 light cruisers, 18 destroyers and other ships from the Pacific Fleet to the Atlantic Fleet. USA: A US Navy base begins operating in Bermuda, which had been leased to the US for 99 years in exchange for destroyers. Atlantic: British armed merchant cruiser HMS COMORIN, damaged by a fire on the previous day, is scuttled by the guns of destroyers HMS BROKE and HMS LINCOLN 450 miles west of Ireland after the entire crew was rescued. Atlantic: German bombers sink the minesweeping trawler HMT ROCHEBONNE off the Lizard peninsula in Cornwall, England. Atlantic: German sub U-124 sinks the Canadian ship PORTADOC 240 miles west of Freetown, Sierra Leone. The entire crew of 20 survives in just two lifeboats. UK: The British government raises income tax again, by another 1 shilling and 6 pence to 10 shillings to the pound. UK: The Gloster E.28/39 jet powered prototype commences taxiing trials at Gloster's Hucclecote airfield in Gloucestershire, England. ETO - UK: Day 214 of 258 of the Blitz. RAF bombers make a night raid on Kiel, Germany. MTO: Great Britain severs their diplomatic relations with Hungary. MTO - Yugoslavia: Day 2 of 12 of the Axis invasion of Yugoslavia. German troops capture Skopje in Macedonia, forcing the Yugoslavian troops to withdraw further south. MTO - Greece: Day 2 of 25 of the Battle of Greece. The RAF bombs Sofia, Bulgaria. MTO - Libya: The German 5th Light Division captures Derna along with two British Generals. A sandstorm keeps the Axis from advancing to Mechili. East Africa: Day 302 of 537 of Italy's East African campaign in the lands south of Egypt. CBI - China: Day 1,371 of 2,987 of the 2nd Sino-Japanese War. Day 25 of 27 of the Battle of Shanggao. CBI - Thailand: Day 189 of 221 of the Franco-Thai War (Vichy France vs Thailand). USA: A meeting between the War Relocation Authority (WRA) and ten western state governors and attorneys general is held in Salt Lake City to discuss an orderly integration into their states of Japanese-Americans to be removed from the west coast. Unanticipated hostility of state officials will lead the WRA to reluctantly pursue the building of internment camps instead. The meeting in Salt Lake City was attended by officials from Arizona, Colorado, Utah, Washington, Oregon, Wyoming, Montana, Idaho, New Mexico, and Nevada. WRA director Milton Eisenhower and many of his WRA colleagues opposed the removal of Japanese-Americans and had sought this meeting to seek support for resettling them into full community life throughout those ten western states. Eisenhower's intent was to move Japanese-Americans to "small inland camps on the model of Civilian Conservation Corps camps" which would serve as staging areas for the evacuees as they were moved into private jobs as soon as possible and could resume something like a normal life. The subsequent responses by state officials stunned Eisenhower. Arizona governor Sidney Osborn said, "We do not propose to be made a dumping ground for enemy aliens from any other state... I cannot too strongly urge that such aliens be placed in concentration camps east of the Rocky Mountains." Idaho attorney general Bert Miller advocated that "all Japanese be put in concentration camps for the remainder of the war and that no attempt should be made to provide work for them," adding, "We want to keep this a white man's country." Wyoming governor Nels Smith said that his state would not "stand for being California's dumping ground." If Japanese-Americans bought land in his state, he added, "there would be Japs hanging from every pine tree." The only partial exception to this perspective came from Colorado's governor Ralph Carr: "If Colorado's part in the war is to take 100,000 of them, then Colorado will take care of them," he stated, a position that would contribute to his not being reelected. Though the reactions were vehement and racist, it was hard to argue with the core objection cited by many of the states: if Japanese-Americans were indeed a security risk who needed to be removed from the West Coast due to "military necessity," what made them less dangerous inland? In vilifying Japanese-Americans to justify exclusion, the federal government had created pariahs. 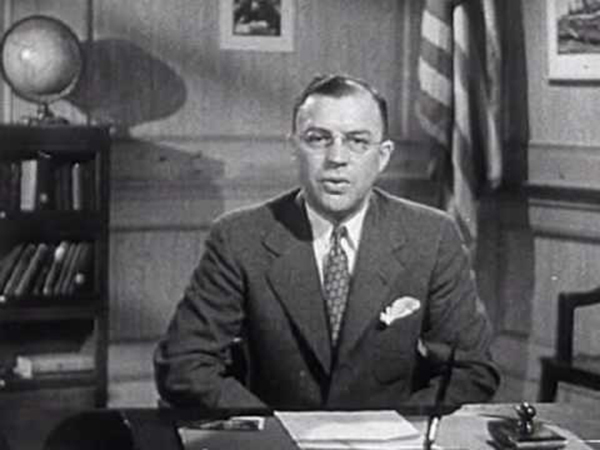 WRA director Milton S Eisenhower, former Land Use Coordinator of the Department of Agriculture and the youngest brother of General and future President Dwight D Eisenhower, summarized at the end of the meeting, "the consensus of the meeting that the plan for reception centers was acceptable to the states so long as the evacuees remained within the reception centers under guard." Concentration camps, it would have to be. Over the next two months, the WRA selected sites for more permanent camps to house Japanese-Americans under armed guard. Unable to sleep at night, Milton Eisenhower eventually resigned in June, 1942. Atlantic: Day 84 of 169 of Germany's Second "Happy Time," during which U-boats sink 609 Allied ships with little risk. U-552 sinks the Norwegian freighter LANCING and British tanker British SPLENDOUR off Cape Hatteras, North Carolina. Germany: Protestant Christian theologian K F Stellbrink and three Roman Catholic priests are arrested by the German government for anti-Nazi activities. Russia: In the Soviet Union, a decree permits local Authorities to distribute uncultivated land to the populace for food growing allotments. Russian Front - North: Day 212 of 872 of the Siege of Leningrad. Russian Front - North: Day 59 of 102 of the Battle of the Demyansk Pocket, another failed attempt to break the siege at Leningrad. Russian Front - North: Day 75 of 103 of the Battle of the Kholm Pocket. Another attempt to break the siege at Leningrad. Russian Front - Center: Day 90 of 103 of the Battle of Vyazma, Russia. Russian Front - Center: Day 90 of 103 of the Battle of Sychevsk, Russia. Russian Front - Center: Day 36 of 49 of the Battle of Rzhev, Russia, a diversion to pull more German troops away from Moscow. Russian Front - South: Day 160 of 248 of the Siege of Sevastopol, Crimean Peninsula. 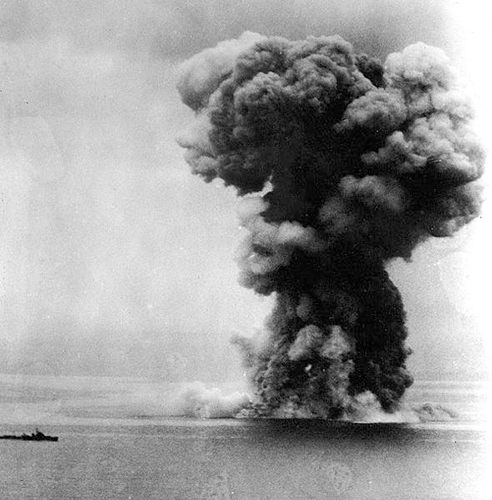 CBI: Day 8 of 11 of the Japanese Naval raids on Allied ships throughout the Indian Ocean. CBI - Burma: Day 115 of 164 of Japan's Invasion of Burma. CBI - China: Day 1,736 of 2,987 of the 2nd Sino-Japanese War. PTO - Malaya: Day 48 of 357 of the Battle of Timor Island. PTO - Philippines: Day 121 of 152 of the 1st Battle of the Philippines. 5th Air Force provides air support. The Japanese penetrate 4 miles in to the US-Filipino lines, bringing the US forces to the brink of collapse. Bolivia: Bolivia declares war on the Axis powers, the only country to do so in 1943. Shortly after, Bolivia's president will be overthrown in a coup and replaced with a ruler with fascist and anti-Semitic leanings, but foreign pressure will compel him to remain at war and to suppress his pro-Nazi supporters. Bolivian mines will supply needed tin to the Allies, but with no coastline, the landlocked country will not be sending troops or warplanes overseas. UK: The British government announces equal war compensation for men and women. Austria: Hitler and Mussolini begin a four-day meeting at the Klessheim Castle near Salzburg, Austria, in an effort to keep Italy in the war. This is the twelfth of their fourteen meetings. Russian Front - North: Day 577 of 872 of the Siege of Leningrad. Russian Front - North: Day 338 of 658 of the Siege of the Kholm Pocket. MTO - Tunisia: Day 142 of 178 of the Battle of Tunisia. The British 1st Army makes progress in the north. RAF and US Air Forces provide Allied air support. Day 16 of 16 of the Battle of El Guettar. The Axis troops have retreated from this region. MTO - Tunisia: German Lieutenant Colonel Claus von Stauffenberg is seriously wounded when his car is strafed by a British fighter-bomber in North Africa. He will go on to be one of the leading members of the failed 20 July plot of 1944 to assassinate Adolf Hitler and remove the Nazi Party from power. CBI - Burma: Day 59 of 79 of the Allied Operation LONGCLOTH. The UK Chindits begin marching toward the Irrawaddy River in Burma en route back to India. US 10th Air Force provides air support. CBI - China: Day 2,101 of 2,987 of the 2nd Sino-Japanese War. PTO - Alaska: Day 305 of 435 of the Battle of Kiska, Aleutian Islands. PTO - Solomon Islands: Day 7 of 16 of Japan's Operation I-GO. Japanese airplanes attack Tulagi Harbor, allowing the Japanese to land reinforcements on Kolombangara Island, New Georgia. Atlantic: The Icelandic airline company, Lofteide HF, founded on 07 Apr 44, flies its first scheduled service. Germany: Two Jews escape from Auschwitz and make it safely to Slovakia. One of them, Rudolf Vrba, submits a report to the Papal Nuncio in Slovakia, which is forwarded to the Vatican. Germany: Goebbels takes overall control of Berlin. Russian Front - North: Day 66 of 191 of the Battle of the Narva Isthmus, Estonia. Both German and Soviet troops in the Baltic region remain in a defensive position. Russian Front - South: Day 106 of 113 of the USSR's Dnieper-Carpathian Offensive in southwestern Ukraine. Russian Front - South: Day 35 of 45 of the Battle of Chernovtsy, Ukraine. Russian Front - South: Day 14 of 15 of the Battle of Kamenets-Podolsky Pocket, Ukraine. Russian Front - South: Day 33 of 44 of the Battle of Snigirevka, Ukraine. Russian Front - South: Day 13 of 20 of the Battle of Odessa, Ukraine. MTO - Italy: Day 82 of 123 of the Battle of Monte Cassino. RAF and US Air Forces provide air support. MTO - Italy: Day 77 of 136 of the Battle of Anzio. RAF and US Air Forces provide air support. CBI - Burma: Day 34 of 166 of the UK's Operation THURSDAY. CBI - Burma: Day 29 of 147 of the Battle of Myitkyina. US 10th Air Force provides air support. CBI - Burma: Day 7 of 302 of the Chinese Salween Offensive. US 14th Air Force provides air support. CBI - China: Day 2,467 of 2,987 of the 2nd Sino-Japanese War. US 14th Air Force P-40s attack several barges and junks at Saint John Island. B-24s sink a large river boat and a small freighter in the China Sea. CBI - India: Day 31 of 118 of the Battle of Imphal-Kohima. PTO: US 7th Air Force B-25s hit Maloelap Atoll, rearm at Majuro Atoll, and bomb Jaluit Atoll on the return flight. PTO - New Guinea: Day 39 of 80 of the Battle of the Admiralty Islands. 5th Air Force provides air support. PTO - New Guinea: Day 202 of 219 of the Battle of Shaggy Ridge. 5th Air Force provides air support. PTO - New Guinea: Day 115 of 597 of the Battle of New Britain. US 13th Air Force provides air support. PTO - Solomon Islands: Day 159 of 295 of the Battle of the Bougainville Islands. US 13th Air Force provides air support. ETO - Germany: A sortie of 180 German BF-109s attacks Allied bombers with the intent of ramming into them, aiming for either the tail, engines or cockpit and bailing out either before or after collision. While only 15 Allied bombers are attacked in this manner, eight are successfully destroyed. A B-24 Liberator spirals out of control, its tail end sliced off by the ramming attack of a Bf-109 of the "Sonderkommando Elbe" task force. 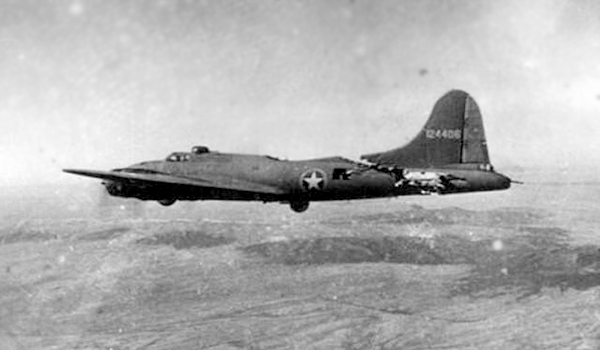 A B-17 Flying Fortress with a deep slice taken out of it by a ramming attack. Amazingly, it still managed to fly back to base. ETO - France: Day 252 of 284 of the Battle of Brittany. ETO - France: Day 205 of 236 of the Siege of Dunkirk. ETO - Germany: Day 33 of 46 of the Battle of the Ruhr Pocket. US 9th Air Force provides air support. US 9th Army captures Eisenach and Hameln. ETO - Germany: Day 4 of 9 of the Battle of Heilbronn. US 1st Army captures Göttingen. 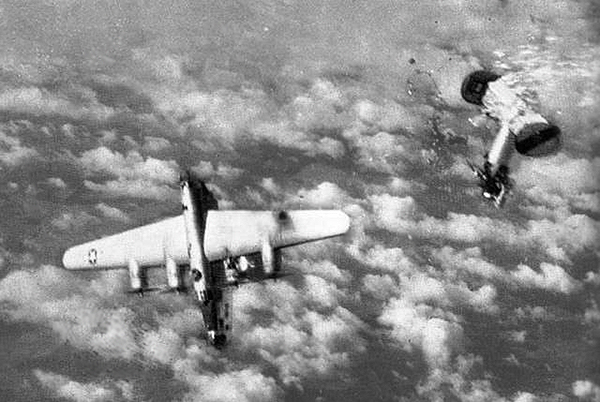 ETO - Germany: US 8th Air Force B-17s and B-24s bomb targets in central and northern Germany. Russian Front - Finland: Day 205 of 223 of the Lapland War. Finland and Russia have joined forces to kick the Germans out of Finland's most northern province. Russian Front - Center: Day 175 of 206 of the Battle of the Courland Pocket in Latvia. Russian Front - Center: Day 73 of 75 of the Battle of Königsberg, East Prussia (now Kaliningrad, Russia). The Germans make an intense counter-attack, which ultimately fails. Russian Front - Center: Day 54 of 83 of the German Siege of Breslau (today Wroclaw, Poland). The Soviets continue with their siege. Russian Front - Center: The German Army attacks the Soviet 2nd and 4th Ukrainian Fronts in Czechoslovakia. Russian Front - South: Day 13 of 21 of the Battle of Nagykanizsa-Körmend, western Hungary. Russian Front - South: Day 26 of 34 of the Battle of Vienna, Austria. MTO - Austria: US 15th Air Force B-17s and B-24s bomb the marshalling yards at Innsbruck, Sankt Veit an der Glan and Klagenfurt. MTO - Italy: Day 2 of 27 of Operation GRAPESHOT, a successful offensive in northern Italy. MTO - Yugoslavia: The German Army Group E evacuates from Sarajevo. CBI - Burma: Day 63 of 99 of the Battle of Pakokku and Irrawaddy River operations in central Burma. The US 10th Air Force provides air support. Anglo-Indian troops attack at Yindaw, which is stubbornly defended by the Japanese. CBI - China: Day 2,832 of 2,987 of the 2nd Sino-Japanese War. Day 7 of 91 of the Battle of Zhijiang. US 14th Air Force provides air support. PTO - Japan: Day 7 of 83 of the Battle of Okinawa. The Japanese are defeated in their last naval offensive, Operation TEN-GO, a deliberate suicide attack upon Allied forces. Japan's super battleship YAMATO, the largest in the world, is sunk by US carrier-borne aircraft, along with 5 other Japanese warships. 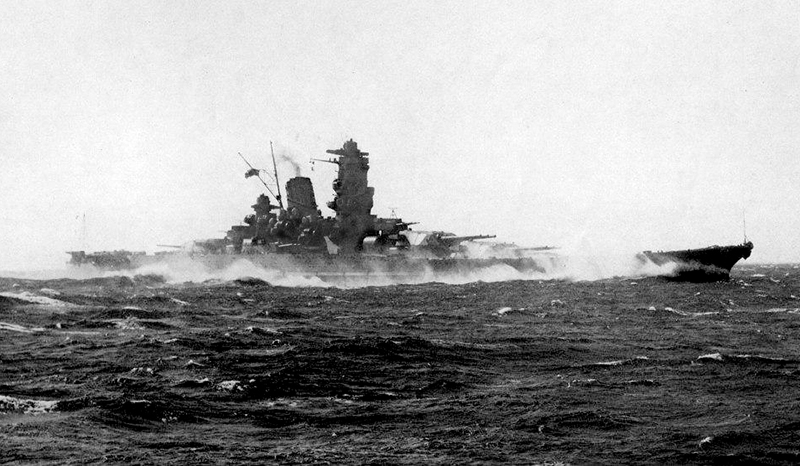 Launched on 08 Aug 40, the YAMATO was an incredibly impressive battleship. Towering over 100 feet in height and in length as long as the Eiffel Tower is tall, its firepower was a force to be reckoned with, carrying the largest guns ever mounted on a war ship. It could, in theory, blow any opposition to shreds. But because it was such an important and obvious target, the YAMATO spent a lot of time in Japanese ports avoiding Allied bombers. The only time it ever saw substantial usage was in this, its last, desperate mission. The plan was to gather the small remnants of the Japanese navy and blaze a trail with the YAMATO to Okinawa, then beach the ship and use it as a stationary gun mount. With its thick hide and massive firepower, it seemed like a pretty good idea. Unfortunately for Japan, the airplane had forever changed how navies would fight. To top things off, the Allies had intercepted and decoded Japanese radio transmissions, learning the particulars of Operation TEN-GO. The YAMATO was hit by at least 11 torpedoes and 6 bombs. 3,055 of the 3,332 men aboard the YAMATO were lost, including fleet commander Vice-Admiral Seiichi Ito. The few survivors were recovered by the four surviving destroyers, which withdrew to Japan. PTO - Formosa: US 5th Air Force bombs the town of Hokko. PTO - Japan: US 20th Air Force B-29s bomb the Nakajima aircraft engine plant at Tokyo and the Mitsubishi aircraft plant at Nagoya. PTO - New Guinea: Day 467 of 597 of the Battle of New Britain. US 10th Air Force provides air support. PTO - New Guinea: Day 351 of 481 of the Battle of Western New Guinea. US 10th Air Force provides air support. PTO - Philippines: Day 170 of 299 of the 2nd Battle of the Philippines, aka the Liberation of the Philippines or the Philippines Campaign. PTO - Philippines: Day 114 of 244 of the Battle of Luzon. 5th Air Force provides air support. PTO - Philippines: Day 29 of 159 of the Battle of Mindanao Island. 5th Air Force provides air support. PTO - Philippines: Day 21 of 135 of the Battle of the Visayas region. US 5th and 7th Air Forces provide air support. China: Ma Bufang and Ma Hongkui announce that they will continue to fight against the communists despite the string of victories that the communists have been achieving in the Chinese Civil War. The story of Japan's super battleship YAMOTO illustrates the closing of one chapter in the history of naval warfare while at the same time the opening of another. A wartime comedy-adventure of a ragtag band of soldiers on a dangerous self-declared mission behind enemy lines to steal a fortune in Nazi gold.